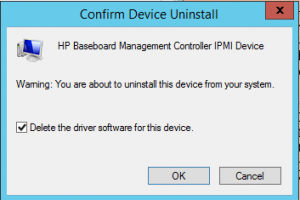 IPMI driver is disabled. Please enable or load the driver and then reboot the system. Service 'ipmidrv (IPMIDRV)' cannot be started due to the following error: Cannot start service IPMIDRV on computer '. Now I could start the service, and the BIOS update proceeded properly. Thank you! Ran into this on multiple PowerEdge T630 servers. THANKS, so after I uninstall the HP drive I have restart the server and run the service to start in powershell. ?